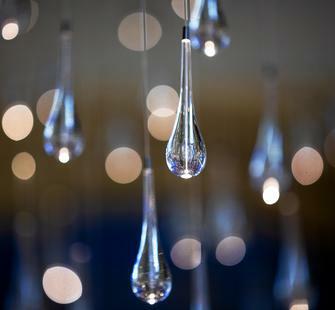 Light Shower is based on a concept that artist Bruce Munro has returned to again and again throughout the course of his career. Site-specific Light Shower installations have been created in many locations, including the Salisbury Cathedral, UK; Cheekwood Gardens, TN; and Longwood Gardens, PA. They have also been acquired into select collections worldwide, and Montalvo Arts Center is honored to be one of them. Through the generous support of Susan and Bob Finocchio, Light Shower will remain in the Solarium of our historic Villa for the public to enjoy for years to come.